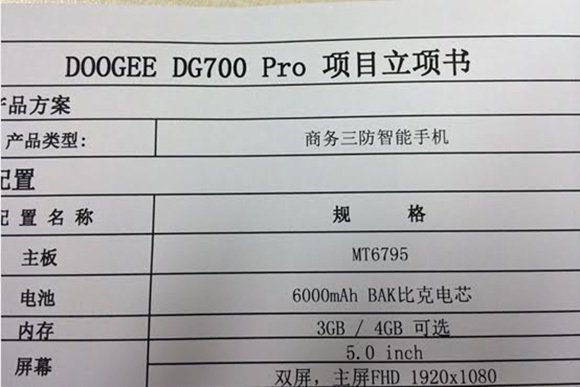 Chinese maker Doogee is working on an interesting new smartphone dubbed DG700 Pro. It will pack MediaTek's latest Helio X10 chipset and is expected to hit China by September. The DG700 Pro will pack a 5-inch display with 1080p resolution and will be powered by the new MediaTek Helio X10 mobile chipset with octa-core 2.2GHz CPU. This chipset also offers 4G LTE support. According to the leaked specifications, there will also be a secondary display but not much details about it were revealed. The smartphone will be offered in two flavors one with 3GB of RAM and other with 4GB of RAM. Quite possibly there would be a difference in the storage capacities. Doogee has packed a massive 6,000 mAh capacity battery inside this handset. If this is the pro Version of DG700 it might be different than the regular version. For dce : its about DG700 PRO not DG700 !! 6000 mAh.